How this works usually works is you take a 3D image of the model that you want to make then convert it into machine code that the machine can read. I don't have actual knowledge of what the model kit companies methods are, but based from my own experience in a company that used CNC's, the machine code we had was so precise that it contained not only the path that the business end of router had to take but also the speed with which it was to cut, the starting and stopping points as well as when to turn on the lubrication and when to turn off the machine. 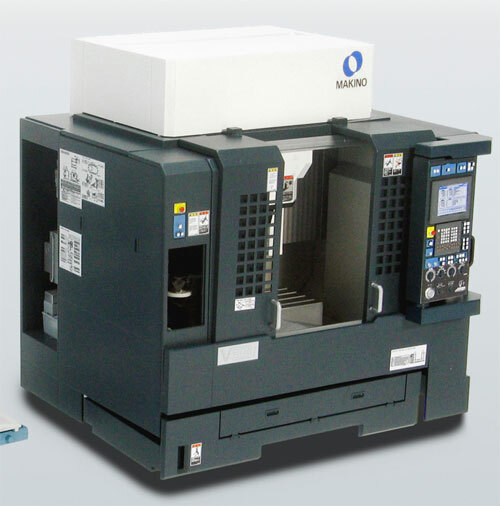 The Makino however seems more advanced as it seems to be able to change cutting heads on the fly. The model kit actually includes two pieces. One is the x-y-z stage of the milling machine. This is where the metal part to be worked on is to be fixed. At first glance a vertical mill will look like a drill press, but the difference being that the "drill" or router part of the mill is designed to handle the huge horizontal stresses (along with the vertical stresses) happening during the cutting operation, unlike an ordinary drill whose cutting stress is only on the y axis. I don't see any clamps to hold the workpiece in place in the picture above, so I am assuming that it could be air suction that will hold the workpiece in place, like what we had in our machines. 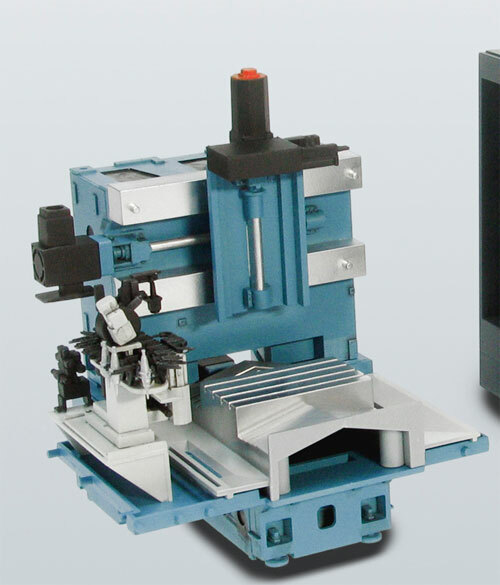 The 2 black box like objects on the top and left side of the model are the stepper motors that control the movement of the vertical and horizontal movement of the workpiece by the use of a gear and a screw. Unlike ordinary motors, stepper motors are used for precise rotational positioning based on the "step" or position you want the shaft of the motor to be in. Sample of an common machine that uses a stepper motor is your average garden variety desktop printer. The stepper motor is what's responsible for keeping the printing head in position. 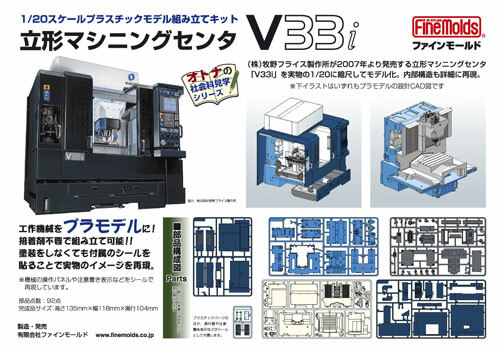 The second model that comes with the kit is the actual machine itself. The vertical milling machine is kept inside an enclosure to prevent the dust and lubricant kicked up during the cutting from getting out and hurting anybody, not to mention making a mess out of the factory floor. That is also where the computer is placed that will translate the stop codes to actual mechanical movement of the stepper motors as well as turn on the cutting heads and choose the cutting bits. From my understanding is that this machine is responsible for making the metal mold. 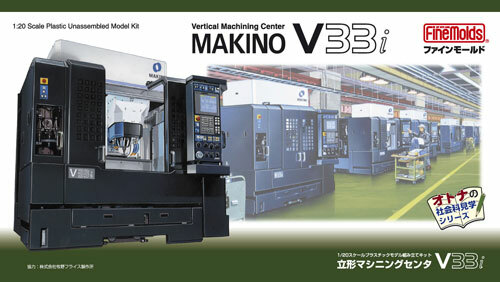 So I am assuming that the finished mold from the Makino will then be placed in a plastic-injection molding machine to spit out the actual plastic models. Video included in the site shows the machine in action. You can't really see anything because of all the lubricant being thrown up during cutting. The machine will spray lubricant in between the cutting tool and the workpiece. The lubricant helps to cool down the cutting bit because of the intense heat generated during cutting. Not sure what type of lubricant they are using but typically it can be either oil or water. This video below shows the machine automatically changing cutting bits based on the job that its going to do. You can see that the toolbox for the different cutting bits are actually sealed, most likely so that the kicked up residue, lubricant and dirt won't contaminate them. Based from my experience, cutting bits are usually carbon tips with diamond like hardness. They are actually tough enough to cut diamonds, but since they are made by a manufacturing process they don't look as beautiful. If you are interested in acquiring the model kit but live out of Japan, you can try ordering it from HLJ since they have it in stock. 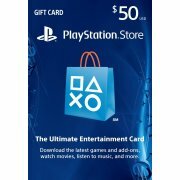 It sells for about Y3,800 right now.